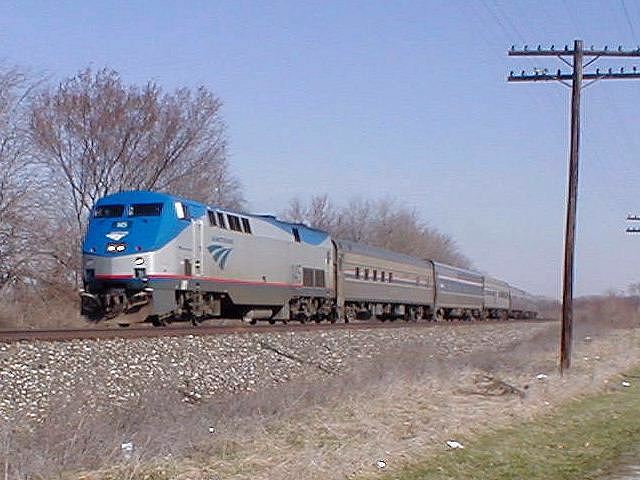 The service on the Big Four had always been first class and I suddenly saw that change in the fall of 1957 when I was heading from Ball State to Purdue for a dance. I was shocked that the agent in Muncie refused to help me carry a huge garment bag with formal and large suitcase several yards to the east of the station to board the train. He said he was too busy but it was probably because I wasn't a paying passenger. Worse yet there was no conductor when I boarded to help me on. A passenger helped me get my luggage on the train and I managed to get them separately down the aisle and onto a seat but since I didn't have great muscle strength I was forced to ride with them beside me to Indianapolis. I had to hire someone in Indianapolis to help me get them off the train and on to the next train. When I got back to Ball State I wrote my dad and asked, "What in heavens name is going on with the New York Central?" as I had never had such bad service. (I wasn't allowed to say the word hell or damn). Apparently a lot was going on with the New York Central that had lots of employees upset as it wasn't long after they began closing depots. I knew after I transferred everything from seven different universities to Kent State I someday wanted to teach at the college level as all the teacher training programs had been so poor and I was sure there was a better way. It took awhile to get a Ph.D. but I finally made that dream come true at the University of Nebraska three months after dad died. I felt so sad he didn't live long enough to see me get it as he always been my support system. As a professor at the University of Nebraska I was called on to consult to Head Start programs and other federal grant programs. It was so depressing to see billions and billions of dollars of federal money wasted on programs not worth the paper they were written on when the railroads were going under. To this day Washington can't seem to understand that handing huge amounts of money to ignorant people doesn't them smarter. If a tiny fraction of that money had been spent on supporting the railroads, half of the rails taken up might still be there. 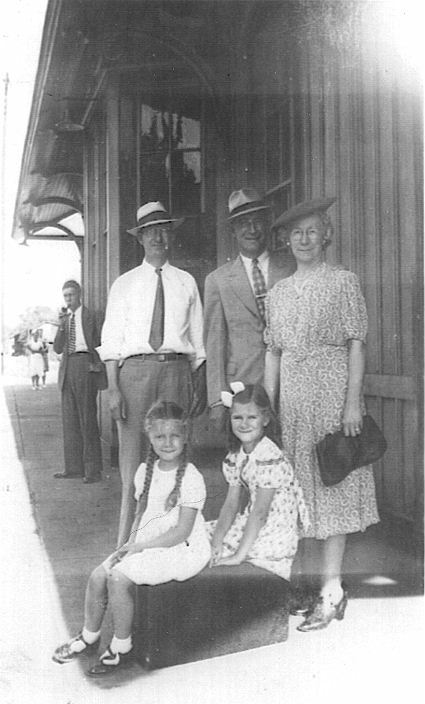 It became obvious over the years that dad was really proud of this country and wanted me to see as much of it as I could as he made a point to change to a different railroad in the middle of nowhere to take in special sights. 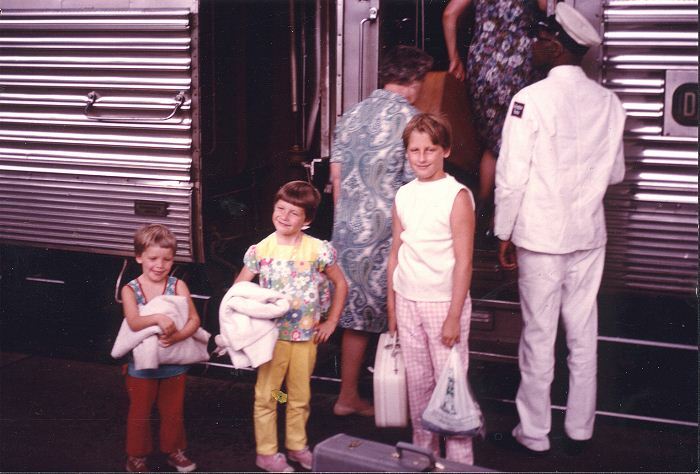 Once we went into Salt Lake City for a few days and then left on a train from Ogden, Utah. 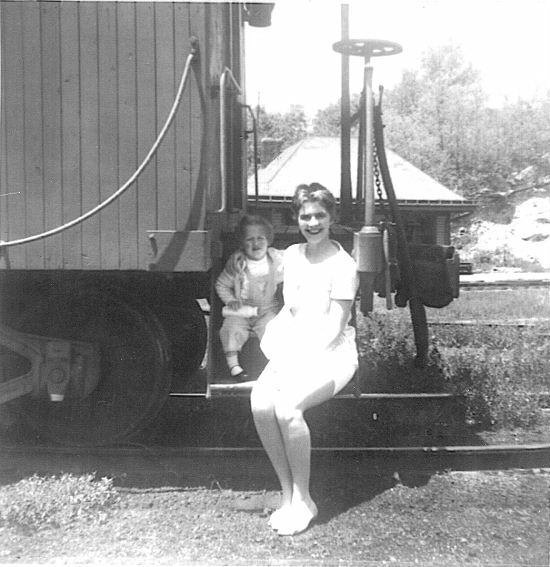 Dad wanted us to switch to Union Pacific so we could go the northern route home. We had to take a cab at great expense to get up to Ogden which is several miles north of Salt Lake City. It was amazing that even though Ogden was out in the middle of nowhere the depot was full of people waiting to depart. Once we arrived in Greeley Colorado at night. We got off the train and spent the night in a hotel and took another railroad south into Denver in the morning. When we went to Mexico we got off at Laredo, Texas and spent the night. I swear those people partied all night as they noise from the street was deafening. In the morning the town was completely silent as we headed across the border by taxi to catch the train to Mexico City. At many sites of beauty we noted people speaking in various foreign tongues but most also knew how to speak English. When we asked them what they wanted to see most in the United States it was nearly always the Grand Canyon. It was amazing that they knew more about our country than most natives. At first I thought it was terrible the poor people of Mexico had to ride on old trains but actually it was really great for them because they could bring on their pets and chickens and there were no airs and it cost almost nothing so people used them and really appreciated them as they brought the outside world to the villages. There were modern trains for the more affluent so there was a train that met the needs of everyone. I have never seen so many people in a railroad station as I did in Mexico City. People came on the train and walked down the aisles selling their wares and people on the train got off and sold theirs so these trains were good for the economy. I saw some of the most beautiful hand made silver items I have ever seen being sold by villagers on those trains. Many of the NYC RR cars ended up in Mexico so the people of Mexico profited from our loss and I have a feeling the people's trains became much nicer and people could use the water fountain without becoming deathly sick. Maybe if we had had more people's trains and put less emphasis on luxury trains that only a few people rode we would still have a great passenger train system in this country. It isn't that passenger trains are passé as they are the heart of the transportation system in Europe. If they can make it work we ought to be able to do it too. It was such a big thing to have a railroad come through your town in the mid 1800's as towns grew because of them and then a hundred years later when towns lost their historic depots and tracks in the blink of an eye there was a sadness beyond belief because those towns were robbed of a piece of their history. People go back looking for traces of certain railroads including depot sites like they were sacred burial grounds. Xenia, Ohio tore down their depot overlooking the Little Miami and Dayton and Xenia Railroads and missed it so much they rebuilt it just as it was before and they are so proud of it as it is a rest haven for bikers on the two bike trails built on the old railroad beds and people from miles around travel to see a new depot. If the people of this country have learned anything from this it is that sometimes we have to lose something precious before we really appreciate the significance of what we had. a) At Wabash Depot ready to leave. Ernst on the left. Karen with pigtails. 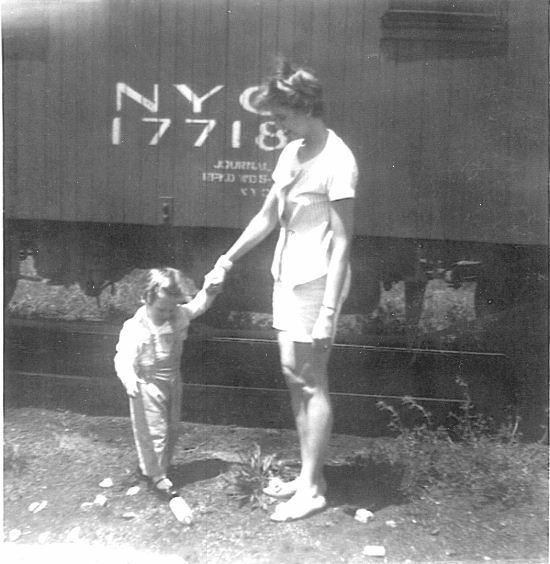 b) and c) Karen with oldest daughter at Wabash, 1960. d) Karen's 3 oldest ready to board at Lincoln Nebraska, 1968. Karen Dinsmore Photos or Collection. People get very emotional about trains if they were a part of their lives and I still get tears when I see an engine or coach that had significance for me. Some people get food cravings but mine are railroad cravings and some days I have this unbelievable urge to go out and walk the rails just one more time. In 1981 I went to the wedding of my nephew in Mayville, Kentucky and we had dinner before the wedding at a restaurant by the Amtrak railroad tracks. I came out of the restaurant and told the man I was dating to wait a minute and kicked off my heels and walked the rails for about 25 feet and walked back and then was satisfied and put on my heels and said I was ready to go to the wedding. He asked "Are you sure"? He was probably in shock because no other woman he had dated would ever do such a thing when dressed so elegantly. He recovered and understanding my love for trains later took me to the Railroad Museum at Chattanooga. He gave me the option of sleeping in one of the Pullman cars but I declined as those bunks are rather small and the price was rather high. About 15 years ago I saw a New York Central train for sale in the J C Penny Catalog with an Alco diesel engine and I was so moved when I saw it as it brought back so many memories I ordered one for a Christmas present to myself. My daughters thought I was crazy but to me it made far more sense than computer games that left them frazzled. I added a Wabash box car and other cars from lines I used to ride. With my train in the lower level, NYC and Big Four buttons on my jacket, New York Central and Big Four logos on the fridge, New York Central glass at my sink, Big Four and New York Central mugs for drinking my coffee in the morning, New York Central books in the family room , a CCC&StL hopper beside my computer in my office to hold business cards and note pads and a New York Central memorabilia collage on my bedroom wall, the New York Central RR is always close to me. 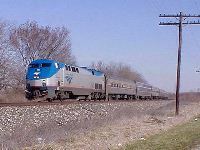 Amtrak Westbound in Anderson Indiana, 2003 - Roger Hensley Photo.